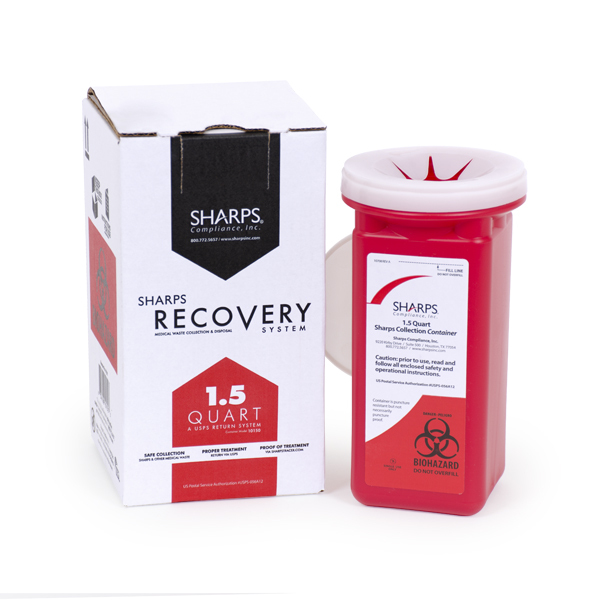 The 1.5-Quart Sharps Recovery System is the ideal solution for the safe collection and proper disposal of sharps and other small quantities of regulated medical waste. Place properly segregated sharps (needles, syringes, lancets), or other regulated medical waste directly into the vertical drop opening. When the sharps container is ready for proper disposal - simply place the sealed sharps container back into the pre-paid return mailing box following instructions included with the System. This cost-effective sharps disposal by mail system presents a safe solution for home users and facilities with very small quantities of sharps or other regulated medical waste. *Special note- the 1.5-quart sharps container can accommodate devices up to 8” in height. IMPORTANT NOTICE: The max return weight on this item is 5 LBS. For every pound over the max weight there is a potential additional charge of $2.00 per LBS.